This article reflects the question of how the need for long-term efficiency improvement at airports can be met through an adapted masterplanning process. It particularly focuses on the early phase of capacity planning. I will describe why, in the future, a true holistic strategy process for airports will be essential, and provide three examples of how this could be achieved in practice. These days, airport development takes place under high economic pressure and with constrained logistical resources. The majority of today’s masterplan projects are expansions of existing airports, not prestigious greenfield projects. The budgets for future infrastructure are limited and there is a clear expectation that the masterplan’s business case must be able to prove its profitability. Additionally, more and more airports are faced with a lack of space for enlargement or are confronted with tight regulatory restrictions, such as noise protection. Over the past two to three years, the need for efficiency improvement has become a common challenge in the industry. Airports can no longer react to the constantly increasing demands by merely adding more infrastructure. Although some airports have begun to improve individual processes, such as self-check-in or automated passport control, these are still stand-alone solutions. From a long-term perspective, a couple of unrelated individual improvements here and there will not be enough. Traditionally, capacity planning has been carried out in a primarily linear, technical and one-dimensional fashion: An unconstrained traffic forecast delivers the basis and the forecasted capacity minus the existing airport capacity indicates the capacity demands for future growth. Even if the traffic forecast used is worked out in scenarios, these will differentiate only in the assumed level of growth. Additionally assumptions used in capacity planning are not communicated transparently or reflected strategically. This is realised by the airport management only at a very late stage in the masterplan process, when the cost estimates for future expansion are presented. But at this point, it becomes very difficult and time-consuming to go back and change the fundamental assumptions of the masterplan. Most people involved in masterplan processes greatly underestimate the extent to which future results are already defined in the early phases of the project: How a traffic forecast is set up, the interpretation of the traffic forecast results and the transformation of the forecasted future demand via a capacity calculation into a capacity demand program, all have a strong impact on determinations for the size and budget of the resulting plan. If alternative options are presented, they are often based on the same set of capacity demand figures as the original solution, which leads to the presented options differentiating only in their physical layout and not in their cost-revenue figures. How can capacity planning react to these new conditions? The following short examples taken from my personal practice provide an overview of what this might look like in a variety of masterplanning situations. A major hub airport was building a terminal expansion. The ongoing traffic growth was greater than the original forecast that had been developed a number of years earlier for the terminal design. The hub carrier at the airport was already worried from the outset that the terminal would be too small and requested that an immediate additional expansion of the terminal be begun. Due to the airport’s tight economic situation and the long timeline required for such an expansion project, this was not a feasible option. The airport’s CEO requested a capacity analysis and proposals for resolving the situation. Utilisation rate: The utilisation rate at the existing terminal was analysed, including check-in, passport and security control. It turned out that even in peak situations, some of the counter and security lines were not staffed. It also became clear that most stakeholders had underestimated the additional capacity that could be achieved if the infrastructure were to be fully utilised. On top of that, although there was a common understanding that this needed to be improved, there was no coordination of activities between the different parties involved. 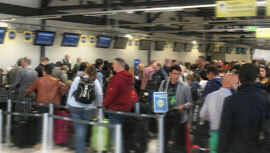 Passenger processing efficiency: In a second step, an analysis was conducted as to how much improvement could be made to the processing rates in both the existing and the new terminal if the airport were to implement the best currently-available technology for passenger processing, such as self-check-in and automatic passport control. Gate and stand utilisation efficiency: Additionally, it was shown that a possible reduction of occupation time per aircraft would increase gate and stand capacity. Our capacity analysis led to a long, but very fruitful, strategic discussion. The airport management decided to establish a process efficiency improvement program for the existing terminal as well as for the expansion. This would deliver enough additional capacity to meet the expected demand, so that the requested additional building expansion would not become necessary for several years. However, it became also clear that, to reach its goals, the process efficiency improvement program would need a team, a budget and management support. Successful capacity planning for future infrastructure requires strategic and ambitious efficiency improvement goals. Otherwise, there is a high risk of just perpetuating the status quo. Influence of processing time on capacity: The figure shows the capacity of 40 check-in counters with different process times per passenger (60, 90, 120 and 150 seconds / pax). The calculation takes into account IATA service level optimum with a maximum waiting time per PAX (mqt) of 15 minutes. Case Study 2: Re-design of Processes Allows for Smaller Terminal Building and an Improved Curb-Side Traffic Situation. During a masterplan project, the airport’s commercial department requested the implementation of 1,000 sq m commercial area per million passengers for the future terminal expansion. Historically at this airport, there was an additional demand for 25% in storage and staff areas. The new terminal was planned for 25 million passengers. Taking into account the circulation and technical areas, this resulted in a programme calling for more than 7,000 sq m of secondary room area. However, the first drafts of the terminal layout made during masterplanning showed that the property available at the airport was not large enough to fulfil this request. In our proposal, we re-designed the complete delivery and storage process for the commercial areas. Instead of including them in the terminal building, we relocated the majority of the secondary areas to a dedicated logistics centre approximately 2 kilometres away from the terminal. From there, goods would be delivered to the terminal in small batches several times during the day. The shift beginnings and ends for the commercial area employees would also take place in this building, which would allow changing and administrative rooms to be located there. Smaller terminal size: The terminal area could be reduced so that it fit within the existing property. Reduced cost: The cost per square meter for the logistics building is only 30-40% that of the terminal. Improved curb-side traffic situation and safety: The number of trucks delivering goods directly to the terminal is greatly reduced, improving the traffic flow around the terminal. In the new process, only one certified service partner from the airport will drive goods between logistics centre and terminal and the security checkpoint will be located in the logistics centre. The example shows that the ability to disrupt and completely re-design specific airport processes can generate totally new approaches to solving a problem. In most cases, far greater results can be achieved than with making improvements to an existing process. Next to the actual re-design of the process, the most challenging aspect is finding solutions for the various concerns of the stakeholders involved, which – as in any change process – will arise. Re-designed process for commercial terminal-logistics: the supplier vehicles deliver their goods to the logistics centre outside of the core airport area. There, the goods are stored, security-checked and, if necessary, also unpacked and distributed to smaller delivery units. The final transport to the terminal is conducted by smaller delivery vehicles from a certified service partner. To reduce the storage space needed in the terminal to an absolute minimum, the deliveries will take place several times a day according to a fixed schedule. Case Study 3: Improving a Masterplan Business Case with Active Peak Demand Management. Constrained scenario: Setting up a second version of the traffic forecast used for the masterplan, with a goal of analysing the effect of 10-20% less peak-hour capacity for the future infrastructure (for the masterplan, the airport had provided an unconstrained traffic forecast only for the first case). Increasing fees: Analysing the effects that a moderate increase to future airport fees would have on the business plan and traffic forecast fees. Controlling future peak demand through incentives: For aircraft movement, this could mean charging a lower price per aircraft for movement outside of the peak times (similar to higher prices at some European airports at night due to noise restrictions). For passengers, it could mean that some of them would receive food and beverage vouchers if they arrived an hour earlier to the airport or if they were willing to use a “slow lane” with longer waiting times to go through security. Product differentiation: A future terminal expansion could have areas with IATA service level optimum designed for legacy carriers and other areas designated for low cost carriers, with a reduced service level and lower fees for the airline. In the end, the client decided to improve the business case through the combination of a reduction to terminal area and a moderate increase to future fees and commercial revenue goals in the business plan. Example of possible product differentiation: Gate holding room, calculated for Code C aircrafts with an average of 180 pax, IATA service level optimum vs. sub-optimum. The ideas outlined above show that the room for manoeuvre in capacity planning is much larger than it usually seems. In the future, either through economic pressure (for example, from low-cost airlines) or due to a lack of space to grow, some airports will no longer be able to deliver the full peak hour capacity demanded by an unconstrained traffic forecast. In these cases, planning for future infrastructure must take into consideration “pro-active“ peak demand management. In the masterplanning stage, an additional, constrained traffic forecast scenario in combination with a business plan and a more iterative process between traffic forecasting and masterplanning will deliver a much more holistic picture of possible options for the future. The goal must be to achieve more active control of the capacity demand that occurs during peak periods. This can either be achieved through “static” solutions, such as product differentiation, or through the implementation of “dynamic” incentives for airlines and passengers. A more holistic approach to the capacity planning phase in airport planning may be challenging, but it is essential. It will require a high degree of management involvement and the letting-go of some traditional beliefs. Most probably, it will also require more time and effort from all parties involved, as the strategic discourse will only function if alternative options, which truly differ from each other, can be compared. The outcome of such a process will deliver a robust roadmap and strategic guidance which will then allow all parties to proceed in a much more aligned and rapid manner. Just as Apple rose to become the world’s most successful computer company by holistically developing hardware and software in combination, airports of the future must, at an early stage of masterplanning, combine the planning of processes-improvement with infrastructure development. Only when all strategic options for building infrastructure, operational processes, and commercial activities as well as security, IT and digitalisation are simultaneously analysed and discussed by the same group of people, will fundamental change be successful. Obviously, such a strategic approach to capacity planning and to the overall masterplan process is only a first step in increasing airport infrastructure efficiency. It is crucial that airports and masterplanning consultants also acquire additional process improvement knowledge. The entire airport development project process must become more agile, which will require that a certain portion of today’s construction budgets be dedicated to efficiency improvement programs. Oliver Hebeisen works as a partner at amd.sigma and as a senior airport planner for Munich Airport International. He has 30 years of experience in the planning of complex building projects. Since 2005, he has specialised in airport planning. Robert Brinkmann works as consultant for amd.sigma. He specialises in capacity planning. All of the calculation examples in this article were developed by Robert Brinkmann.